Explosive NBA power forward known for his shot-blocking abilities and highlight reel dunks. He played his first 9 seasons with the Atlanta Hawks, then spent a year and a half with the Detroit Pistons. He has also played for the Houston Rockets, Los Angeles Clippers and Sichuan Blue Whales. He was selected 17th overall in the 2004 NBA Draft directly out of Virginia's Oak Hill Academy. In his rookie year, he was the 2005 Slam Dunk champion. He was raised with four siblings: Phebe, Kasola, Shanti and Walter. He married Alexandria Smith in 2010 and he has two sons, Jett and Josh, and a daughter, Genesis. 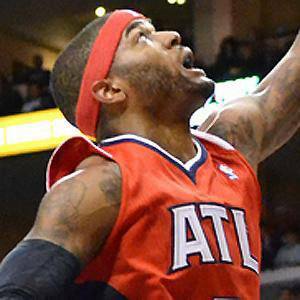 He was teammates with Joe Johnson on the Hawks from 2005 to 2012.